20" or less wide by 45" or less in height - .250"
Products greater than the dimensions listed above are not warranted against warpage. Note: Flat panel and frame-only doors are warranted to 40" or less in height. * Please note that all products greater than 20" in width and/or 45" in height will receive a center rail. Additional charges may apply. Products greater than the dimensions listed above are not warranted against warpage. Note: All slab doors will have two (2) cross bar supports attached to the back of each door with screws and glue so as to prevent warpage of the door as much as possible, however, we will not guarantee against the warpage of such doors. ** Please refer to the CAD drawing specs of a slab door for examples showing these cross supports. These drawings can be found in our full catalog. Advantage Cabinet Doors manufactures its products to the nearest 1/16" and a tolerance of +/- 1/16" is considered acceptable. 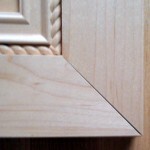 Note: We strive for perfection in everything that we do and we normally strive to provide each of our products with a tolerance of +/- 1/32", of the original size ordered, but this close of a tolerance is not always possible due to sanding of the products. Wood acts like a sponge. It expands with moisture and shrinks when it’s dry. However, unlike a sponge it doesn’t change uniformly. Instead, it moves differently according to the grain. Wood moves the least across the grain (Tangentially) and the most with the grain (Radially). Hardwoods are considered hygroscopic materials and will absorb or release moisture until it is in equilibrium with the moisture in the air. When wood is exposed to a constant humidity, it will achieve a specific equilibrium moisture content (or EMC). Changes in humidity will cause changes in EMC, which will ultimately cause the wood to expand or contract depending on atmospheric conditions. While a pre-applied finish will slow this activity, it will not prevent it from occurring. Advantage Cabinet Doors currently manufactures the majority of their products at an EMC range of 10-15% (6%-8% is a typical level in most homes), so your cabinet doors and drawer fronts will tend to shrink over time after they are installed in your home. This will vary from home to home depending on weather conditions and seasonal temperatures in your area. This will also be affected by what temperature you operate your air conditioner and/or heater in your home. We have found that it is different in almost every home. This is an example indicating the potential change in width of a 12" panel in a variety of species when subjected in a change of EMC from 7% to 14%. As an example, Red Oak will move by more than 3/8". Change in width can be affected by such factors as the radial cut of the wood and may be larger or smaller than the amounts shown above. This is an example indicating the potential change in width of a 12" panel in a variety of species when subjected in a reduction of EMC from 7% to 4%. A 3% drop will cause shrinkage of 0.08" to 0.18" on a 12” wide panel depending on species. As an example, Hickory will shrink by nearly 3/16". Change in width can be affected by such factors as the radial cut of the wood and may be larger or smaller than the amounts shown above. 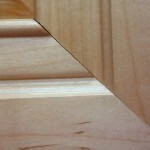 In cases with extreme moisture gain, larger doors can attain a barrel effect, where the middle of the door is wider than the corners due to swelling of the panel. This effect would be most apparent on full overlay applications.